A stunning spacious duplex penthouse built to a very high standard with polished marble floors, vanity units in bathrooms, fully integrated modern kitchen and appliances and American style fridge freezer. Very tastefully furnished in a beautiful, contemporary style with everything you need to ensure your stay is as pleasurable as possible! 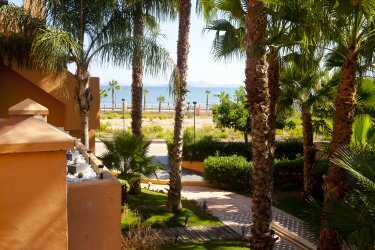 The apartment overlooks a communal garden and from the balcony you have views of the sea, across the Mar Menor. Upper level has double ensuite bedroom with his and hers walk in wardrobes and private terrace with sun loungers. Two further twin bedrooms and a second bathroom on the lower level. Hairdryers iron and ironing board supplied. There is a 32 inch flat screen TV for use with DVD' or Spanish TV only. 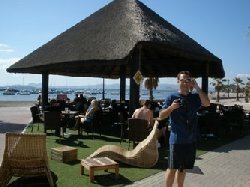 Lounge/diner extends onto terrace with table and chairs, 46� flat screen TV, DVD, satellite showing all UK channels. The shared pool is encircled by lush green gardens and palm trees, owners provide 4 sun loungers for sole use by guests. Beautifully designed beach front apartments (64 in total) built around a communal pool, with the beach being at the back door. Restaurants and shops within 15 minutes walk. 20 euros of air-conditioning is included, after this, you pay for you what you use with cards for the metre.